There's something reassuringly business-like about ReadyNAS NVX Pioneer Edition. It has an aesthetic that shouts 'I'm small/home office and proud,' and it's weighty, too. With clean lines and impressive spec, it's a tempting plug-n-play solution for those that want both a competent media server and bullet-proof data storage with back. Our review model is actually part of a five-strong line-up of lookalike models from the brand with capacities which range from 2TB to 8TB. The version tested is the RNDX4250, which ships with two 500GB drives and space for two more (four hot-swappable bays in all). Typical price is around £500. The unit itself is reasonably quiet, if not whisper silent. In a living room environment it could be deemed rather intrusive. If you, like me, use a boot room to house your NAS, this is less of an issue. The good news is it stays cool. Even running constantly over a couple of months, power management seems excellent. This ReadyNAS requires little real effort to install on a network. Control is via a straightforward web interface and a setup wizard holds your hand during the installation process. As a media centre the NVX is accomplished. Out of the box, ReadyDNLA ensures playback of videos, music and snaps from DLNA/UPnP AV network media players and devices, and the unit was recognized by all devices when I placed it on my review network. Naturally Netgear would like you to use it with its own EVA-branded media streamers, but it seems to work with everything. Play-out of 720p MKV files was smooth and stutter free; standard-def AVIs likewise. Streamed music retained all the integrity of the ripped files. As an AV system it's difficult to fault. Functionality is good. There's a built-in Apple iTunes server, as well as support for other popular music distribution systems, such as the Logitech Squeezebox, Sonos and Roku SoundBridge. There's also an integrated Bittorent client, meaning you can download straight to the NAS without needing to keep PCs powered during the process. Connectivity includes a trio of USBs (one front-mounted). This means USB print server sharing (turn any USB printer into a network printer) and provision for extra capacity expansion via external drives. There are two Gigabit Ethernet ports and a handy front-mounted LCD display which reveals its IP address and capacity usage. 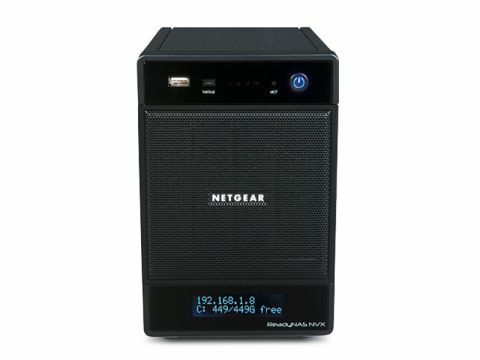 The unit was run in Netgear's proprietary X-RAID2 mode, which means files are written to two drives as backup against a drive failure. There's also an integrated backup manager that enables one-button backup to an external USB drive. Overall, I can't fault this NVX NAS. Aside from its dour demeanour and relatively high ticket price, it's fast, reliable and easy to use. And significantly, I never felt my sound and vision was in unreliable hands.